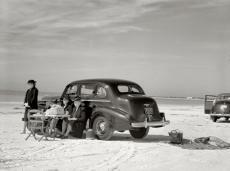 A WOMAN REMEMBERS AN EARLIER TIME WHILE PICKNICING ON A FLORIDA BEACH IN 1941. Was it with back then? Out at the sea now. Of love here, who knows. Long Blonde Hair and Eyes Of Blue.